Once you start tasting wines, you’ll notice there are a whole lot of new words to learn like tannin, bouquet, cru, and legs. In the series “Wine Lingo Basics,” we will cover some of these terms and how to use them. Terroir is a French term that we use to describe wine and it means the specific characteristics of a place—how geography, geology and climate combine with the grape varietal to create a wine vintage’s signature flavor. Terroir’s direct translation is “a sense of place.” Isn’t that what makes wine so amazing? Each vintage tastes differently because the climate is never exactly the same year to year. Even vineyard neighbors will have distinctive flavors between their grapes because the soil and elements are going to differ slightly. You may not be able to taste the difference in the grape straight off the vine, but the fermentation process magnifies these minute differences creating distinct and unique flavors. 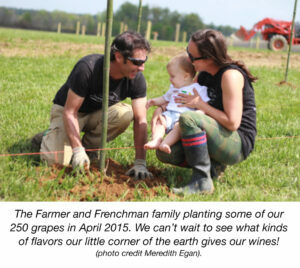 We are excited to join other wineries in the tri-state area and for you to explore each facility’s signature terroir. Our grapes won’t be ready for harvest for another few years, but we have started making wine already using grapes from other wineries.